President Muhammadu Buhari is the only President invited to grace the 20th anniversary of the adoption of the ICC Rome Statute. Abuja — President Muhammadu Buhari on Monday in The Hague, Netherlands, met with over 20 chief executive officers of Dutch companies, assuring them of safe and secure environment in Nigeria for their investments, as well as huge returns. The president will today address the International Criminal Court (ICC), at The Hague. This is coming as Nigerians in The Netherlands have tasked the president to speedily end the protracted killings of innocent Nigerians in the country. In a statement issued yesterday, the president's Special Adviser on Media and Publicity, Mr. Femi Adesina, said security was prerequisite to successful investment, hence, Buhari's emphasis on security. "After security, our next emphasis is reviving the economy, and then, fighting corruption," the president reportedly said. According to the statement, the president commended many Dutch-owned companies operating in Nigeria for what he described as their fair dealings, recalling that the relationship with many of them "dates back to more than two generations, and it is now almost a blood relationship rather than commercial." The statement also stated that Buhari was impressed by the economic cooperation between Nigeria and The Netherlands, and urged the CEOs to build factories in Nigeria, and source raw materials locally rather than wholesale import. Adesina also said the president spoke about Royal Dutch Shell and the need to harness Nigeria's gas potentials saying: "We are more of a gas than petroleum producing country. We should be making more money from gas today than we make from petroleum, but the plans we made were scuttled. "When I was Petroleum Minister (in the 1970s) for three-and-a-quarter years, the plan we had was to have 12 LNG trains by 1983, but more than a generation later, we are just on the 7th train. This was because some people came, and did just what they liked. If they knew what they were doing, we would have gone very far by now." in Nigeria, Hein Schumacher of FrieslandCampina described Nigeria as "a most important country to us," promising that the conglomerate would invest about 11 million euros in a "ready to drink project, using 100 per million locally sourced milk." It also said Schumacher pledged continuous training for dairy farmers, and provision of fortified milk for school pupils adding that Andrew Brown of Shell, which it said had done business for over 60 years in Nigeria, with over 3,000 local employees, assured that that the company would maintain its emphasis on oil and power generation, while Roland Pirmez of Heineken commended the government for "stability in exchange rate for the past six to eight months." Disclosing that his own company was planning to use renewable energy for its power needs, Klaus Struilesma of Cownexxion, Adesina stated, indicated the interest of the organisation in building cattle ranches in Nigeria. 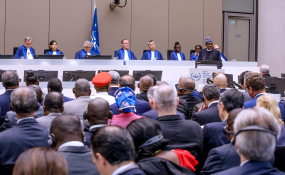 A statement by Adesina, said the Nigerian leader was the only president invited to grace the 20th anniversary of the adoption of the ICC Rome Statute. President Buhari yesterday met with the Dutch Prime Minister, Mark Rutte. The two leaders discussed issues relating to the fight against insurgency in the North-east, climate change, particularly the shrinkage of Lake Chad, economic cooperation, the fight against corruption and a range of other issues of mutual interest. Buhari highlighted the progress made in the fight against insurgency in the North-east, while the Dutch Prime Minister pledged the support of his government to anti-terrorism efforts in the region. In another statement yesterday, Senior Special Assistant to the President on Media and Publicity, Malam Garuba Shehu said Buhari had directed the Minister of Foreign Affairs, Geoffrey Onyeama and the Minister of State for Aviation, Senator Hadi Sirika, to commence the process of repatriating Nigerians who went to Russia for the FIFA 2018 World Cup and were stranded after the competition. Shehu said some Nigerian football fans were stranded in the country following the activities of some unscrupulous travel agents whom he said cancelled their return tickets and abandoned them to their fate. Against this background, Shehu said Onyema and Sirika had in compliance with the president's directive taken the necessary steps to bring back home the stranded Nigerians. According to him, the presidential directive is in line with the policy of the current administration to ensure the welfare of all Nigerians in every part of the world, recalling that the Buhari administration had on several occasions ensured the repatriation of Nigerians from foreign countries like Libya and other conflict zones. Meanwhile, Nigerians in The Netherlands yesterday tasked President Muhammadu Buhari to end the protracted killings of innocent Nigerians in the country. They also tasked citizens to play active roles in the effort to end violence ravaging the country. This call was made when Buhari met with the Netherlands' chapter of Nigerians in Diaspora Organisation (NIDO) on the sidelines of his official visit to The Hague, Netherlands, yesterday. According to a statement by Adesina, NIDO Chairman, Julius Nwakpa while speaking on the security situation in Nigeria, urged both "the government and security team to accelerate stoppage of unfortunate killings in the country." He said Nwankpa also tasked Nigerians "to play their roles in breaking the cycle of violence, which usually has no winner." It also said Nwankpa commended Buhari on the war against corruption for which he said the president had "earned respect around the world," adding that the NIDO Chairman commended the president on what he described as high improvement in infrastructural development, and for signing into law "the Diaspora Commission Bill," which he hoped would "become effective as soon as possible." The statement added that the president was pleased by Nigerians' level of intellectual and professional achievements and equally praised members of NIDO for representing Nigeria well, and for always being in touch with their motherland. "I am pleased with the quality of people I am seeing. You are high quality people. Congratulations on your personal achievements," the president was quoted as saying. According to Adesina, those who met Buhari besides Nwankpa, were Dr. Mustapha Gidado, a specialist in tuberculosis, having oversight over management of the disease in 22 countries; Lola Visser Mabogunje, a performance monitoring expert; Dr Peter Ngene, a research scientist and Assistant Professor at Utrecht University; Cornelius Obot, a software expert, and Toyin Loyo, an artist and culture enthusiast of international repute. He said the delegation presented the gift of an artwork called 'Light to President Buhari,' with Toyin Loyo, the creator of the work saying: "The work is illuminating. You bring light, which will never go out, and which will shine round the clock."